PST file splitter software also split Outlook PST files items such as emails, calendars, notes, tasks etc. It also supports corrupted or inaccessible Outlook PST file to split. 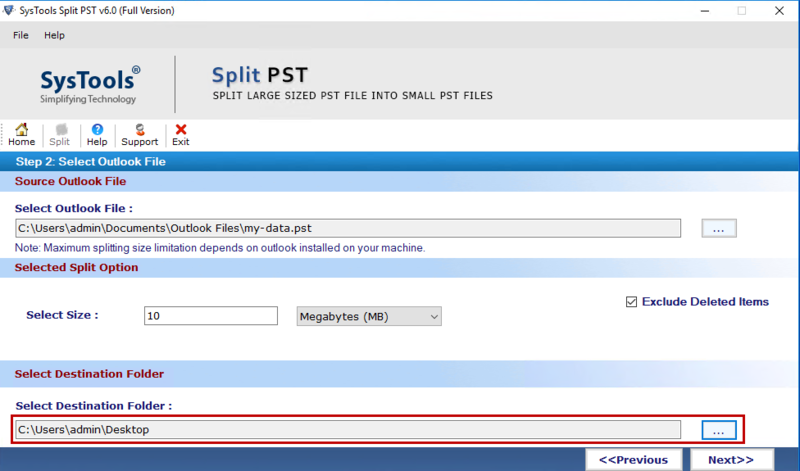 Break large Outlook PST files with Split PST tool. It also provides option to exclude deleted item folders. Split unlimited Outlook PST into smaller PST by creating New PST. 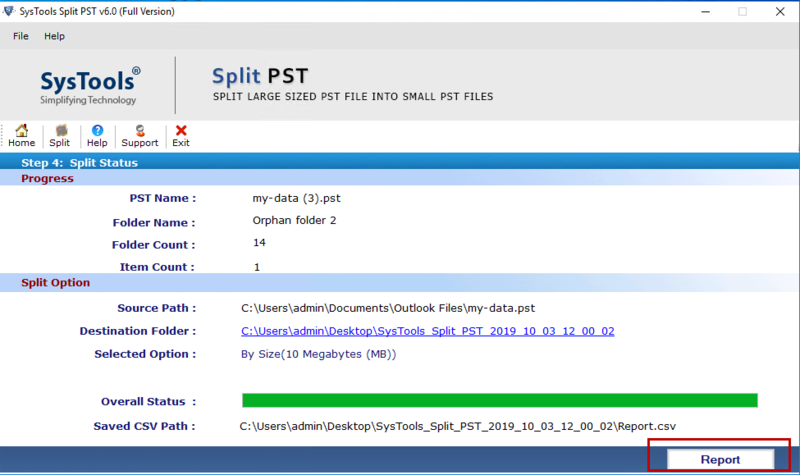 Split Outlook PST File - Date, Year, Folder and Size. Split PST File all Data Items including Emails, Contacts, Calendars, Tasks etc. Supports Corrupted or Inaccessible Outlook PST files to split. Split both UNICODE & ANSI PST with no File Size Limitation. Need MS Outlook installation for splitting huge PST files. Single panel utility, No need to navigate it on other screen. Corrupted Outlook PST files should be recovered before splitting. Split Outlook PST file by Size option permits you to select PST file by desirable size range. For e.g. If you have 2 GB of PST file then you can either choose 2 files of 1 GB or 4 files of 512 MB. You can select specific date range and break PST files in Outlook creating PST file for after and before the specified date range. In this option you need to choose the exact date before and after in which you wish to split. This is the way to divide PST file by year so that you can create separate PST file based on specific year range. For e.g. you can divide PST file between two selected years like 2000-2016. This option allows to Splitting PST files by folder (Inbox, Outbox, Sent items etc). If the size is more than the particular selected folder then the tool create other division of that folder. By using the software, users can easily improve Outlook performance by reducing PST file size by splitting them into multiple smaller chunks without any data hampering. The PST Splitter tool can easily divide entire Outlook mailbox like journals, notes, contacts, calendars, task etc into multiple smaller parts. You can easily save them at secure location. Split PST software provides speedy process of dividing Outlook PST files so that users don't have to waste their precious time while installing & processing it. No technical skill is required. Split Outlook PST File Software kept all its Meta data informations like to, cc, bcc, sent & receive , attachments, date etc as it is during the entire splitting process. PST Splitter software supports all versions of MS Outlook 2000, 2003, 2007, 2010 (32 bit and 64 bit), 2013 (32 bit and 64 bit), 2016 (32 bit and 64 bit) and MS windows XP, Vista, 2000, 2003, 2008, Window 7 and Window 8. 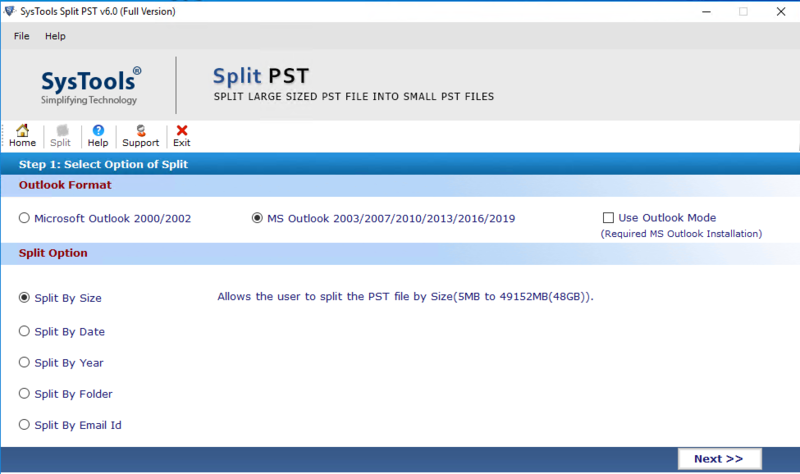 Split PST Tool has potential to split unlimited Outlook PST files without any data loss. You can divide any numbers of PST into smaller parts.The software creates NEW PST for each splitted folder. The PST Splitter allows to break archive.pst file/folder. The Split PST Software gives the option to divide Outlook archive by date, by size, by year & by folder which can thus be easily manageable after importing it in MS Outlook. While choosing the splitting option, select the Outlook format which you are using. The tool supports Outlook 2000, 2002, 2003, 2007, 2010, 2013 & 2016. Hence, when you specify the Outlook version the software will automatically observe the PST format. Simple Steps to Divide PST files into Smaller Parts – Get it Here! After selecting split file option, you need to import larger PST file which you need to split into smaller one. Select destination folder where you want to keep the splitted files and click on Split to process. Online Video to Check How PST Splitter Tool Works to Break large Outlook PST files into Small Size PST Files !! 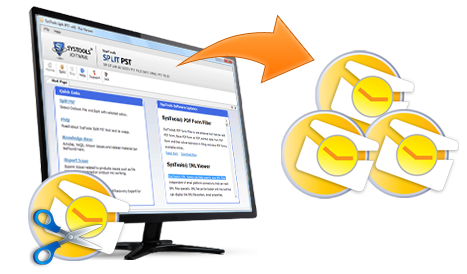 The free version of PST splitter will only split the first 50 emails. If the user opt for "Split PST by Folder" option then the tool will break up 10 emails in each folder. After having experience with other commercial solutions in the market, I had grown several doubts on other tools. However, one day I found Split PST file software, I had no faith left. But to my surprise when I used this tool I saw precise solutions while splitting PST files of larger size. I would like to suggest you all, if you want to split large PST file into smaller parts then you can easily rely on best PST Splitter software. This tool offers both simplicity & a package of efficiency & effectiveness. â€œJust Buy it & Try itâ€. It was very difficult for me to walk out from Outlook just because of the file size limitation. So I did something out of my way & had purchased best PST Split software. The application is user-friendly & can split PST by date, folder, size & year with proper management. From last few days, Outlook failed to provide utmost performance. Probably this is due to large PST files as I searched on forums. In one such forums, a expert person suggested me to try Split Outlook PST file tool. I tried the demo version and found it quite useful. I sincerely thanks to him. Really great to software to deal upon to break large Outlook archive PST files. At first, I faced multiple obstruction while using Outlook as business email client. But later on, I developed habit to deal with these issues and problem. To gain this confidence I took the help of Split PST tool. It worked like a expert user who seriously works on real time projects. The software proved its worth. As a token of gratitude, I would like to suggest this software to my friend and family circle too. Splitting oversized Outlook PST files is very difficult task with the manual solution. But after getting this tool, the process seems to very simple and easy. I used split PST software to break oversized PST files of Outlook 2013 into small size PST files. Thanks Justin (expert at quora) to suggest me this tool. I am very much grateful to you for this. Does the Split PST file Software supports Windows 8 platform? Yes, the PST splitter Software is compatible with Windows 10, 8, 8.1 & below versions of it. Is there any file size limitation of Split PST software to separate PST files? No, you can Split Outlook file of any size. The tool does not urge such file size limitations. How many Outlook PST files can I add to the software at once? You can only add one PST at a time for the splitting purpose. Can this tool split archive PST data properly? Yes, the software ensures to split PST by Date, by Size, by Year & by Folder. With the help of PST splitter can I verify PST files with source Outlook PST Files? Yes, you can easily verify PST all data items with the source PST items as the tool generates a process report at the end of the operation in CSV file format. Can I split corrupted PST files too? No, the PST Splitter tool lets you divide healthy Outlook data files only. For corrupt PST files you have to repair PST file using any recovery software & then you can free download Split PST tool to break PST file into smaller files. Can I split 50GB PST file with split PST software? Yes, you can easily break down PST file of any size. The software does not impose any file size limitation on Outlook PST.